Using the familiar At A Glance format, the second edition of this best-seller takes the reader through a complete review course of metabolism in health and disease. The salient features of a metabolic pathway are highlighted on a detailed background map, offering the choice to absorb as much, or as little, of the available information as required. The text has been updated to include inborn errors of metabolism and new chapters on porphyrins, cholesterol and sports/exercise metabolism. Another major feature is the extensively revised chapters on diabetes. Metabolism At A Glance will be an invaluable aid to students requiring a knowledge of metabolism for undergraduate medical, biochemistry, veterinary, sports science and nutrition courses, and for biomedical scientists and clinicians specializing in diabetes and inborn errors of metabolism. 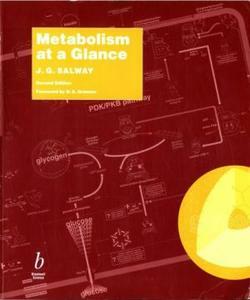 "…a highly comprehensive set of notes and pathway maps concentrated exclusively on metabolism. If you are after an easy going metabolism book for revision or as a good reference guide, this would be the ideal choice, as it is not too daunting to read and had plenty of well-organised pathway maps to keep you busy. This is especially useful for first year medics as part of their foundation study revision"